Fluted Corinthian columns flank the sides of the ornate mantel shelf and frieze. A two step bull-nosed raised hearth which is an additional cost. 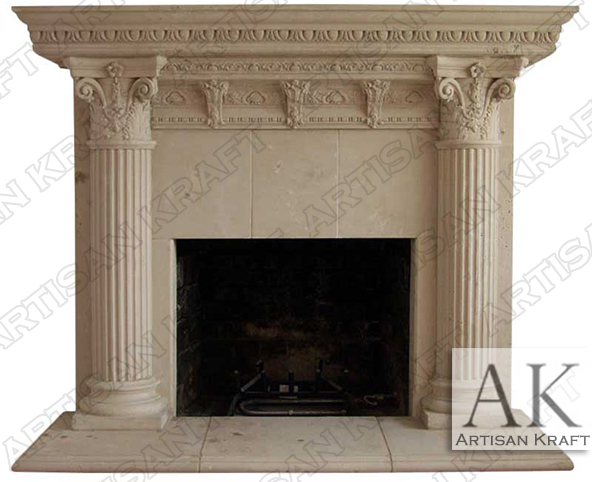 The Rhodes Cast stone is an ancient style fireplace mantel surround. GFRC is a man made stone that looks and feels like natural stone. It is lighter and because of that easier to install. It is also a great option where weight is an issue. Typical Dimensions: 68″ wide x 50″ high *can be made to custom dimensions. Stone: Precast, limestone, sandstone, marble etc. Available in many different colors, textures and finishes.